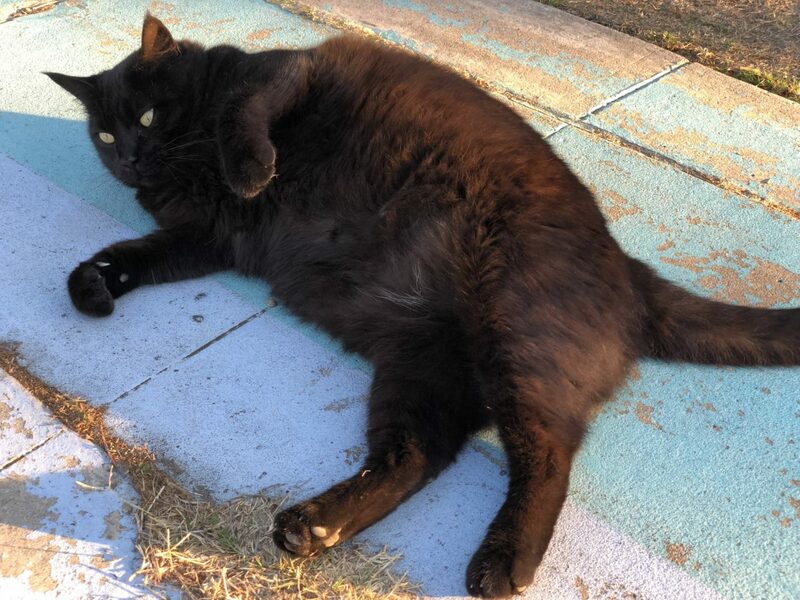 Near the neighborhood’s southern boundary, I made a new feline friend, while learning a valuable lesson about identification. Yesterday, as I walked home from Smart & Final, along Mississippi Street, I spotted a kitty nestled beside a porch. Seemingly glowing eyes glared back against black mat in the distance. As I stooped low to capture a photo using iPhone X, the beastie trotted across the driveway to the sidewalk. From the name on the collar, I had just made acquaintance with Daisy. She rolled around on the cement, relishing pats and marking scent on my hands and legs with her head. 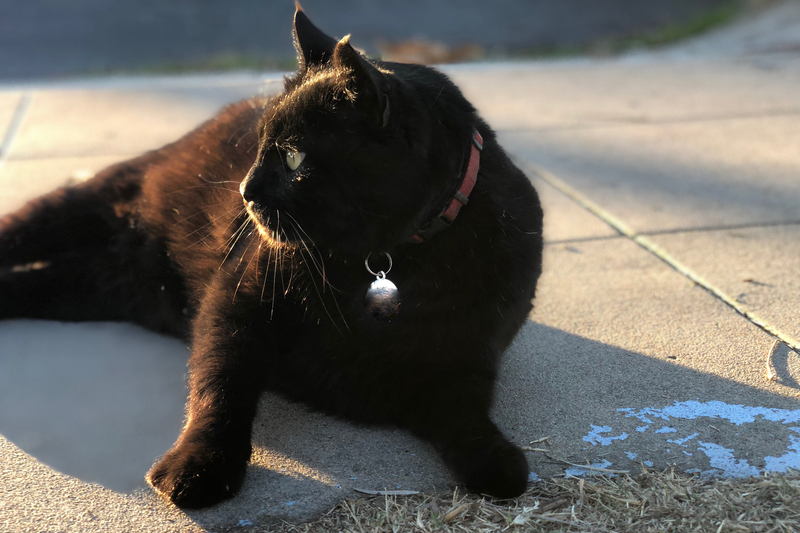 Not long later, the cat’s master came home—and, of course, the animal would step into the driveway in front of the vehicle. Behind the wheel, the woman explained that this frequently happens; toot of the horn scooted Daisy to safety. Except that’s not her name. “He’s wearing the dog’s tag”, she explained. I had instead met Peohe. Barking sounds rose from inside the house; perhaps Daisy heard her owner’s voice or the auto pulling into the driveway. As for Peohe, he was adopted 12 years ago from the animal shelter, BTW. Thank you for rescuing a rescue. In all the time I owned iPhone 7 Plus and successor X, I hadn’t tried the so-called Portrait mode that uses both lenses and some software magic to blur the background. Can you say bokeh? It was about time to give it a go! The Featured Image and first of the two companion pics were taken that way. I apologize to the owner if she feels the main photo isn’t flattering. 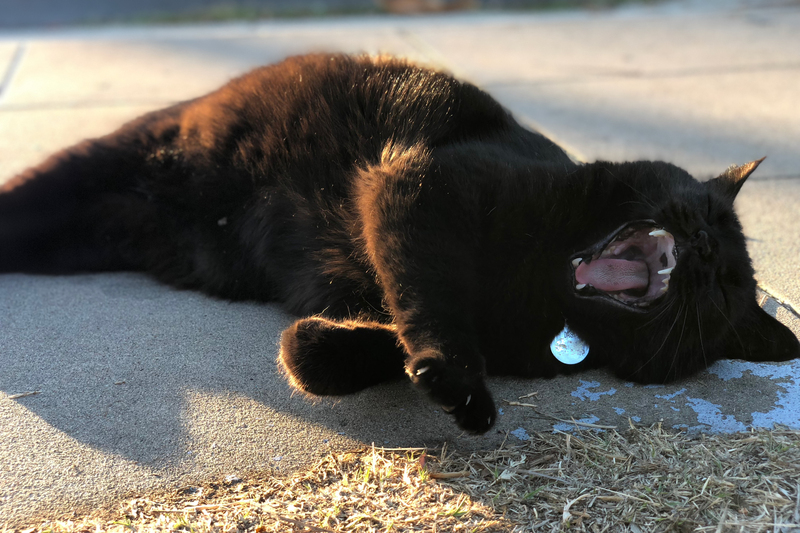 The yawn makes me laugh, and I hope you do, too. Vitals: f/2.4, ISO 25, 1/60 sec, 6mm; 4:08 p.m. PST. Second is same, except for ISO 20. The last: f/2.4, ISO 25, ev .97, 1/60 sec, 6mm; 4:06 p.m. I used a spot-removal tool to obscure the address and phone number that appears on Peohe’s Daisy tag—for the privacy of the owner. Other than 3:2 cropping, the portraits are not otherwise altered. Don’t miss: Scruffy, Roly Poly, Woo, Skull, Biscuit, The Colonel, White, Chipper, Frisky, Stretch, Needy, Farfisa, Mates, Hunter, Pee-Pee, Blue, Blue Too, Bonded Pair, Patience, Fess, Jumper, Frenemy, Looker, Cozy, Scout, Lurks, Skit, Mini, Betty, Black and White, Stalker, Bell, Chill, Sammy, Scratch, Poser, Star, Grey and White, Watcher, Herman, Comet, Roman, Willow, Chub, Nimbus, Watson, Lilo, Kit, Pepe, Twilight, Sebastian, Spot, Booger, Ash, Veruca, Riley, Mellow, Bonde, Flower, Glass, Black, BeBe, Fang, Bruce, Siamese, Pounce, Tortie, Haiku, Fraidy, Peso, Daniel Tiger, Dusk, Stride, Dainty, Spry, Tabby, Betty Too, Still, Levi, Shadow, Sophie, Wink, Ferals, Momma, Charlie, Tux, Cool, Benny, Jellicle, Itchy Valentino, Goldie, Nine, Amanda, Siesta, ChaCho, Charlie, Too, Mika, Crystal, Seeker, Mittens, Dancer, Smokey, Monkey, Captain Blackbeard, Season, Maven, Tink, Chunk, Curious, Hanoi, Bella, Tarry, Guido, Maxine, and Mr. Kitty.